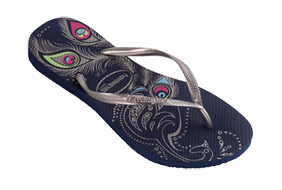 Speaking of flip flops, check out Havaianas new summer line of women's flip flops. They have new prints, styles and even added crystal embellishments! Enter to win a pair of Havaianas Slim Peacock flip flops! Fill out the form below to win! For extra entries, you can sign up for my mailing list, post a link to this giveaway on your blog, follow my blog, follow me and retweet on Twitter , or become a fan onFacebook; just make sure to list the entries in the form. Also, make sure to enter your mailing address, color choice and flip flop size for the flip flops - Enter up to once a day! This giveaway is open to US residents. The contest will end on Saturday, May 1st. I will randomly select the lucky winner and announce them on Lipgloss Break, so keep checking to see if you're a winner - Good Luck! I love these flip flops! In the summer I wear nothing else but sandels. I love showing off a manicured toe with a flower on my big toe! I think I gave you the wrong color. I was looking at all their different styles and got lost. In the peacock line would love the grey. Thanks. Can a mother & daughter living together both register and win? I had to move back in with my mom after I lost my job and hope this doesn't make me ineligible with us both having the same address. Thanks for the help. I think I was looking at wrong style when on their site the other day. In the peacock line I did like the navy and have corrected my entry today. I think the previous entries may have had a different style and color. Please disregard. The navy is the correct color and style. Sorry for the confusion. hey this is haleena and would like to wear the flip flap and i really appreciate the effort of the blogger.